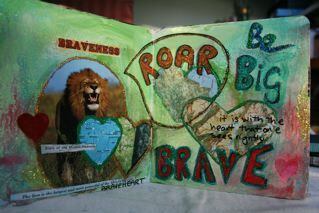 What my lovely group learnt was 'backgrounding' Creating pages for working on. 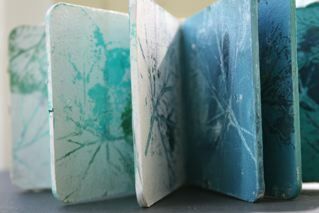 How to use gesso and what it does to a page. 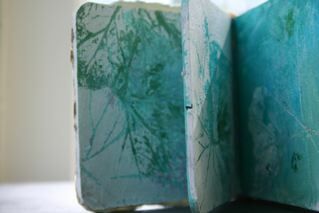 Printing with leaves to create texture and interest and some colour play.What I learnt was I didnt have to spoon feed and too much information really is too much information. The initial introduction and some ideas were enough. They were all creative people who bought their own knowledge to the table and started making and responding and continued with that exploration themselves.They worked very independently, It was fun. 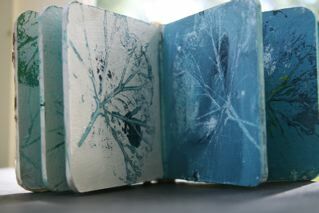 the Cover is screen printing of a kowhai flower I did a few years back. 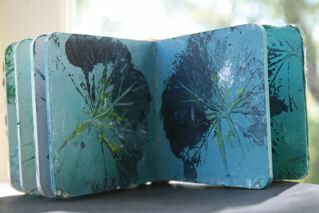 Inside the book is Gesso with Matisse acrylic paint. 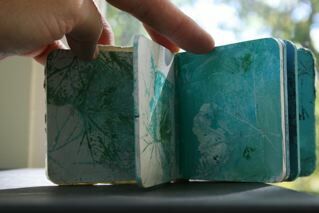 Painted on leaves and pressed between pages. Gel transfers are a great way to create translucent images that can be incorporated into your artwork as a collage element. Once you get the basic concept down, you can go off in all sorts of directions with these transfers. A gel transfer derives its name from the transfer of an image from paper onto the surface of acrylic gel. Before we get started: this is a rather experimental process, no guarantees. You will have to play around to find out what works for you. Step 1. Coat a laser copy with a clear gel. Polymer Medium, Gloss, a thin medium will take several coats. Allow each coat to dry. Other options, Soft Gel Gloss, Self Leveling Gel or Tar Gel will only require one coat. Coat image directly. Let dry thoroughly. Thick applications of gel will take longer to dry. The image of the lady lamp was coated with Tar Gel. Note: work on wax paper or a plastic garbage bag. Acrylic won't stick to these surfaces. Step 2. Wet or dampen the paper side. Carefully rub off the paper. Use sponges, scrubbies or a soft cloth. This usually takes several rubbings to remove the paper. Allow to dry. When dry you will see the spots where you have not completely removed paper. When the dry gel is completely saturated with water it will turn white, but this will clear when the skin dries. Step 3. Use the "skin" as a collage element. 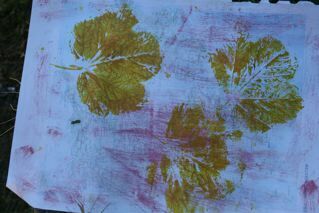 This sample was painted on the backside of image skin with Golden Fluids. It was glued down with Soft Gel Gloss Gel. Nearly any gel, medium, or acrylic paint will work to lift an image, depending on the texture, clarity, and color you want to trap the image within. to remove the paper a few times, for a clean transfer. When the water evaporates, you will be able to see the areas that you missed. Heavy Gel Gloss--This dries to a clear glass like surface completely transparent. The Molding Paste was tinted with a small amount of Fluid Green Gold. 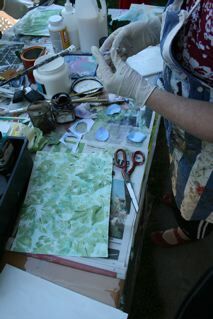 Molding Paste dries to a very flat surface retaining good detail with transfers. mixture of Diarylide Yellow and Pyrrole Red Matte Fluids. Light Molding Paste is a porous with a "frosting" like viscosity. This sample was mixed with Fluid Quin Red Light, for a luscious pink. This image took several steps. 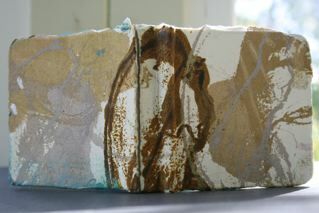 A layer of Pumice Gel Coarse was applied with a palette knife and allowed to dry. The dry Pumice Gel was stained with Fluids: Green Gold and Vat Orange, thinned with water. 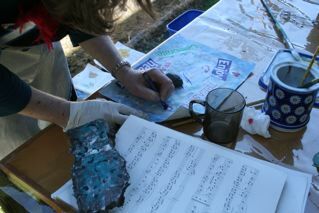 When this stain was dry, a layer of Tar Gel was poured on top, immediately the transfer was applied . The Crackle Paste was applied with a palette knife. If you apply it thickly, the cracks will be large and highly irregular. Thinner applications will promote a smaller crackle. Apply the transfer while the Crackle Paste is wet. The cracks will appear overnight. After the transfer is removed, stain the surface with Iridescent Bronze Fluid, thinned with water. The area where the transfer is applied will not crack. The clock image was trimmed before application. The Scotty Dog Clock ( was applied to a mix of Acrylic Ground for Pastel, tinted with a few drops of Fluid Quinacridone Gold/Nickel Azo Yellow. 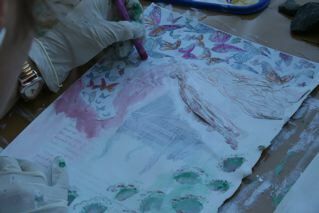 A thin application of the Acrylic Ground for Pastels allows the base color to show through. The dry surface has a slight tooth for drawing with graphite, color pencil, or pastel. It also imparts a wonderful surface for watercolor like washes with thinned Fluids. This clock was applied to a mixture of Coarse Granular Gel tinted with a few drops of Cobalt Teal Fluid. The Granular Gel dries to a irregular surface, so transfers do not retain all the detail. This clock was transferred into one thin coat of Interference Oxide Red Fluid. 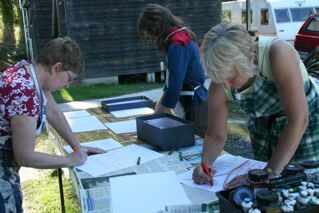 These are the new workshops for 6 Degrees Of creativity..check then out,look like fun!